Moments with the Mays: I'm alive--brain dump. I'm still alive! Ben's laptop has a virus & is currently not working AND BlogPress on my iPad is super lame...therefore, I am having a hard time getting computer time. I am currently sitting at my kitchen counter with our super old and ghetto fab laptop that has to be plugged in straight to the router and has a screen that falls off. oh, and a wonky mouse. AND I can't forget the random missing keys. Seriously...it's in bad shape. I'm daydreaming of a new computer for myself. (not happening) Santa? Anyone?! We've been really busy lately but until I have a place to upload pictures, a good old fashioned brain dump will have to do. I have a HeyTelling problem. It is so fun! It really bugs me when people beg for followers on their blog. Like, REALLY bugs me. I also just don't understand strange shortened words when people are talking/typing. Adorbs, for instance. 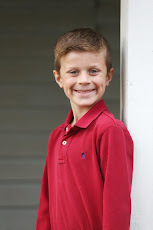 Why can't people just say adorable? I don't know. Sounds like something that 12 year old Laura would have said. Grayson started feeding himself with a spoon this week! It's so adorbs cute to watch but the control freak in me is having a hard time dealing with the mess. He ends up with yogurt or applesauce ALL over the place. He's gotta learn sometime! I'm hoping this will help him branch out & not be so picky. I'm trying macaroni and cheese tonight...we'll see if he will eat it like a big boy! 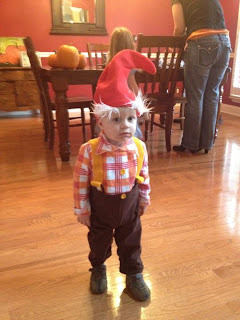 Grayson is going to be a garden gnome for Halloween this year and the costume cracks me up. He just looks so funny! I've determined that candy corn and peanuts are my favorite snack of all time. Not the healthiest, but definitely the tastiest. It was SO good! It just tastes like fall and was so easy to put together. Hopefully I will be back soon with either a fixed computer or a NEW computer! Thanks for all of the love on my new dark hair...I am finally used to it and don't have to look twice when I walk by a mirror! Adorbs! Just kidding! But I'm totally guilty of using that word on twitter!! I hope your computer problems pan out! I miss your blog! 1) So thankful you're a determined blogger. I missed you! 2) I, too, share your disdain for abbreviated words. Adorbs doesn't get me quite like totes (totally). A tote is already an object used for caring things. Why must it be used to shorten a word that is one brief syllable longer? Drives me nuts! 3) We are working on the spoon/self feeding as well. Lord help me! Sutton gets so excited when I hand him the spoon that he shakes his fist while holding the spoon. Many a mashed potatoes/yogurt/applesauce have been sacrificed in the process. We should start a support group for OCD mom's of toddlers. I'm sure we are not alone. 5) I am addicted to candy corn. Praise the Lord it is seasonal! That caramel apple trifle BETTER be made for MOPS! The abbreviated word that gets me is "totes". 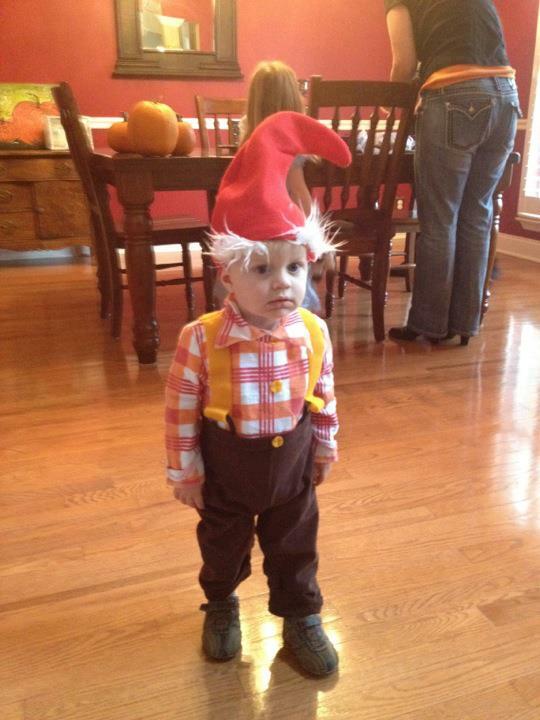 You have the most adorable gnome ever. That costume is hilarious! I had to chuckle about your laptop. It sounds a lot like our old one with once missing, but now loose keys, scratches and cd-rom drive door that falls off. We gave it to our daughter to use in her room and she's thrilled with it, even if it's on its last leg! And love your little gnome!! !